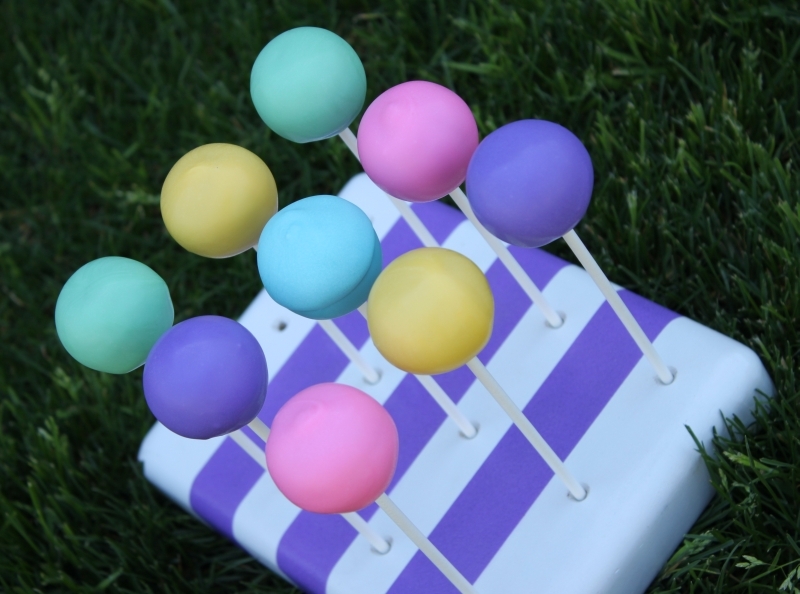 This week in AZ it feels more like Summer then the start of Spring, but with Easter and Spring Festivals around the corner it’s time to post some Cake Pops with a Spring look! I try to cater my blog posts around the questions I most frequently get asked… And this time of year I hear, “What is an Easy Spring Cake Pop to make?” Or “How to do you make your Cake Pops Sparkle?” If you have ever asked that, this post is for you!! Next you will dip all these cake balls into some pastel colors! I mix all my pastels myself, but you can buy them pre tinted as well. To mix yourself start with white candy melts of your choice (I use Plymouth Almond Bark because it’s convienent), melt them on 50% power, and then add one to two drops of candy color to the melted candy melts. Continue to add color until the desired tone is reached. I usually use Wilton Candy Color, and just a little goes a long way, so start with just one or two drops. Another tip… Icing Color and Candy Color look pretty darn close to each other (only the Icing color is a bigger jar) DO NOT be tempted by the bigger jar, DO NOT BUY ICING COLOR!! It’s a water base dye and will seize up your candy melts! Please double-check your color, just read the ingredients and make sure it DOES NOT contain any water. Even when buying Oil Bases Candy Color it’s best to shake it well before using. Once you have all your colors dipped it’s time for the FUN part! Lots of Pearl Dust!! I have quite a collection, this is only a little bit of my stash, but no worries you don’t need to go out and buy a ton of colors! 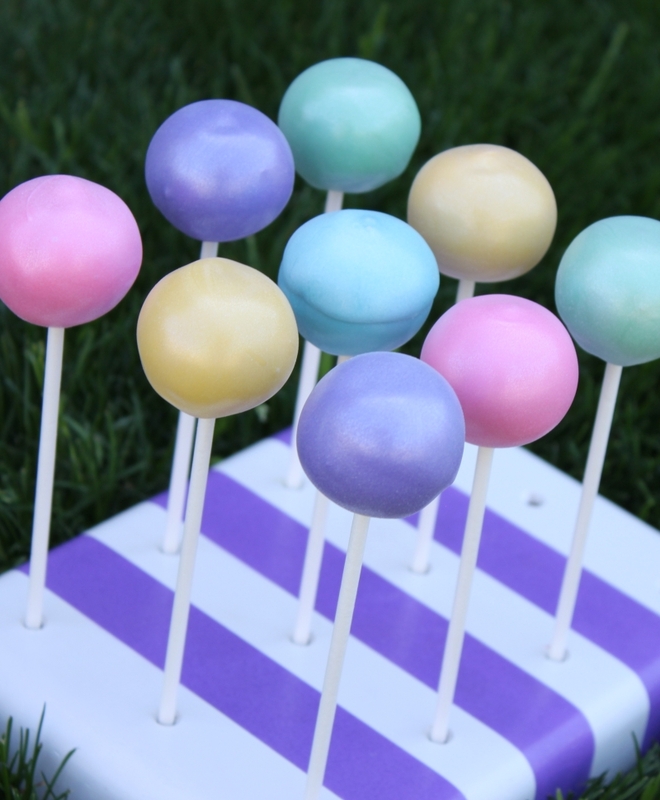 For the Pastel Cake Pops, all you REALLY need is the white or Pearl one! Sometimes the white sparkle will mute the color a bit, but for pastels it’s perfect! Wilton makes the long skinny tubes (you can find them at your hobby store like Micheal’s – They are called Pear Dust and come in lots of colors, but like I said, just start with the white/pearl one.) And the other jars I find online or if you are lucky enough to hit the “cakey conventions” The Sugar Art is always there and you can get more pearl dust for the same price or less! Get a plate, because you will have a lot of dust fall off your cake pops and you can re-use what falls onto the plate! 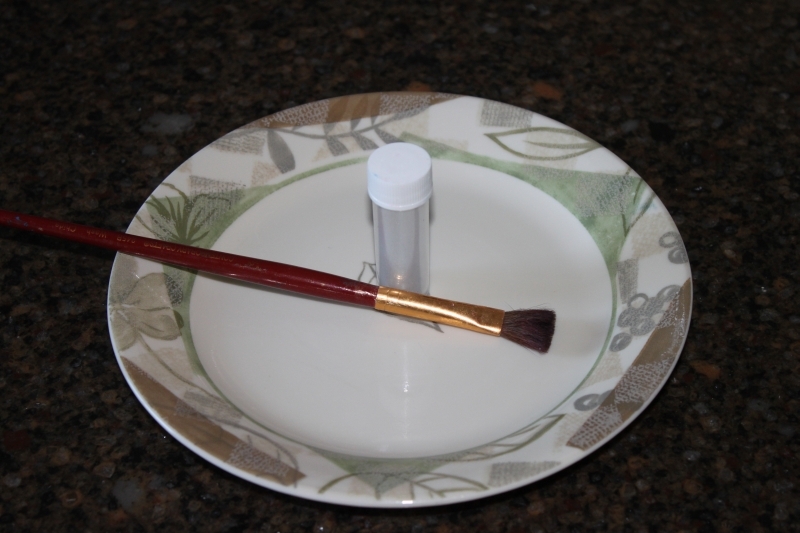 A soft paint brush …preferably one you buy just for food;)! That’s it!! We are just going to dry brush the pearl dust directly onto the Cake Pops. 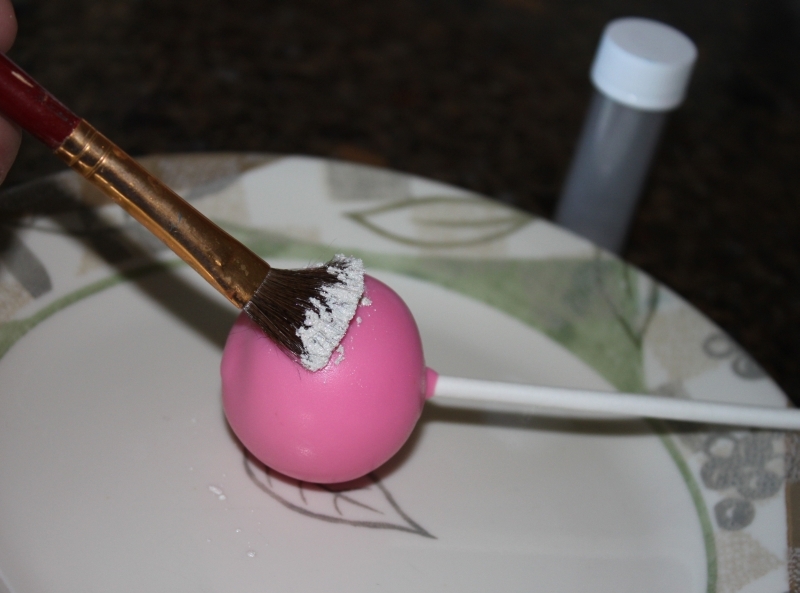 So dip the end of your dry paint brush into the White Pear Dust and over the plate just start brushing the dust all around the cake pop. That’s it! 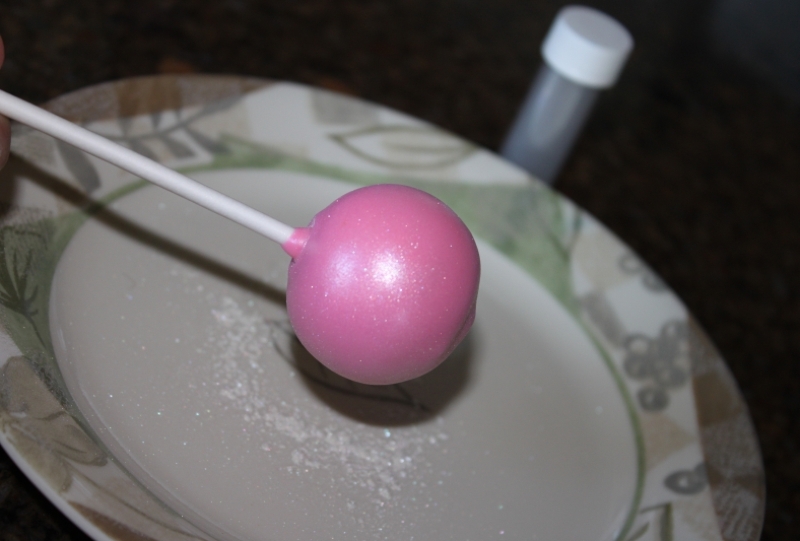 It will be a pink sparkling cake pop when you are done! See all that dust that fell onto the plate? I will use that left over dust to cover the next cake pop before I dip my brush back into the jar of new pearl dust. 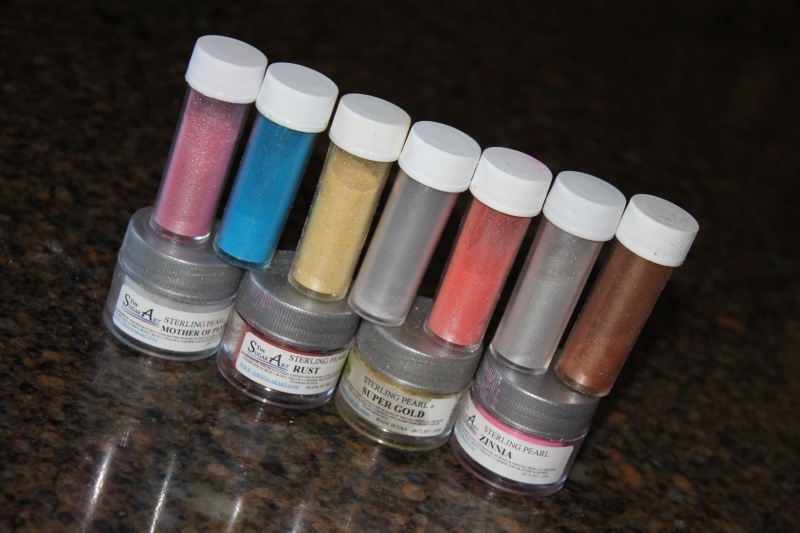 By doing this, that small little tube of Pearl Dust will last me long enough to cover about 80 cake pops! 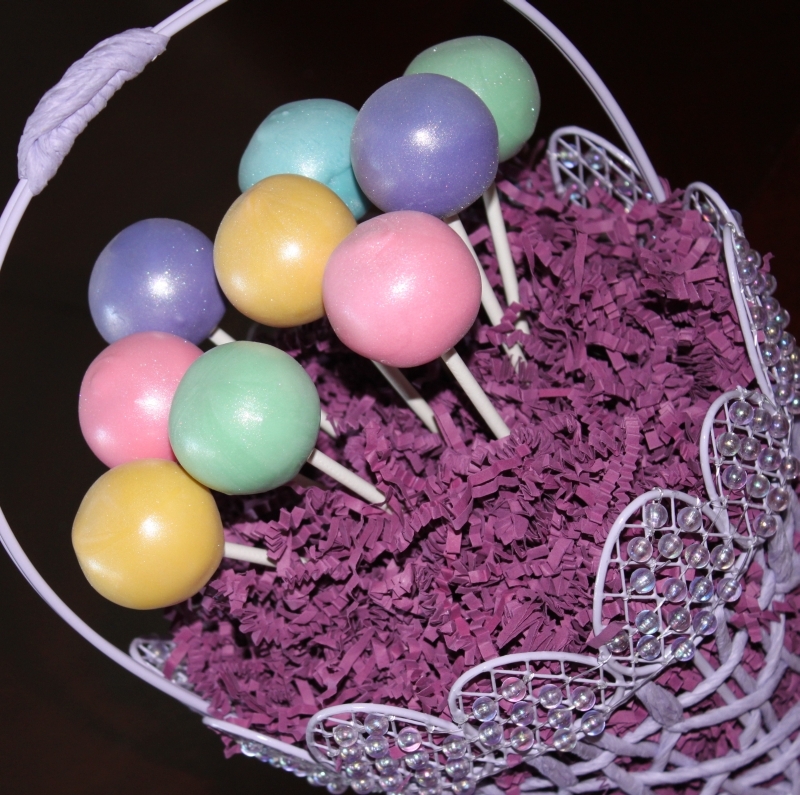 When you are done you can display your Sparkley Pastel Cake Pops in your Cake Pop Stand, or in a Basket for an Easter Center Peice! For more Spring Cake Pops, check out all of these AWESOME BLOGGERS who share in my love of cake pops. We also started a group Pinterest Board where we have shared our collection of fun cake pops. If you’re looking for cake pop ideas, look no further!